Ok so this Greenberg / Zuckerberg thing is getting weirder by the second. A Jacob Greenberg was arrested for possession of Marijuana and this mugshot was taken. It was later revealed that this could indeed be the man the world knows as Mark Zuckerberg. 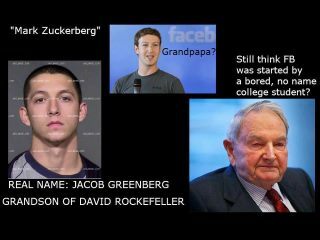 His family members include David Rockefeller, his Grandfather. A little strange because Rothschild owns 8% of Facebook shares. Both Rothschild and Rockefeller are well known names….TAP with One World Government associations. bit suspicious. I wonder if Google has similar disguised progeny. The Tap Blog is a collective of like-minded researchers and writers who’ve joined forces to distribute information and voice opinions avoided by the world’s media.